The cat fight that ended on the scaffold. 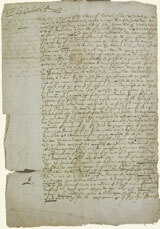 In 1587, Elizabeth signed Mary's death warrant (above) convicting her of treason. 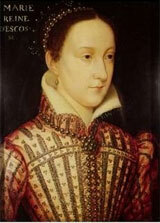 Mary was beheaded at Fotheringhay Castle on February 8, 1587. Mary knew that her execution would shock the rest of the world. At her trial she said, “Remember that the theatre of the world is wider than the realm of England.” Elizabeth did not need the warning. She was very aware that Mary's execution would cause the world to choose sides. Ironically, it still does today.